Michael Thompson shot even par in round 3 of the Sanderson Farms Championship. He'll be heading into the final round tied for 28th. He tees off at 9:31 am and will be grouped with Sebastian Cappelen and fellow University of Alabama alum Cory Whitsett. Yesterday's one over par 72 was Michael Thompson's first round over par at the McGladrey Classic after posting 9 straight sub par rounds so it was a bit of an anomaly, especially since the round included a rare four putt from within birdie range. Michael shrugged it off in today's third round and bounced back with a solid three under par 67. He moved up the leader board nine spots and is currently T12, five shots off the lead. Michael will look to finish strong in tomorrow's final round when he tees of at 12:00pm ET with Rory Sabbatini. Michael had a scrappy round 2. An early double bogey (he started on 10) had him giving up some ground and he spent the rest of the day trying to catch up. The day ended on a positive note with a birdie on 9, +1 for the day. Michael has already teed off for round 3 at Sea Island. Today he's grouped with Ken Duke and Steven Alker. If you like to see more of Michael's comments after round 1 you can read his interview transcript here. The second PGA Tournament of the young 2014-2015 season gets underway Thursday in Las Vegas at the Shriners Hospitals for Children Open. Michael Thompson will look to turn his luck around after missing the cut last week by a single shot. Michael will be playing the first two rounds with John Merrick and George McNeil. They tee off on Thursday from the tenth hole at 12:30pm PT. Michael Thompson will be playing at the Travelers Championship this week. He tees off at 12:40pm ET with Stuart Appleby and Kyle Stanley. Here are all the links you'll need to follow Michael's round online. After failing to qualify for the US Open earlier this week, Michael Thompson has put his focus and energy into getting ready for this week's FedEx St. Jude Classic being held at TPC Southwind in Memphis, Tennessee. Michael will be grouped with Kevin Streelman and Charles Howell III for the first two rounds. They tee off Thursday morning at 7:40am CT (8:40am ET) from the first hole. After Friday's rough day on the greens, Michael Thompson righted the ship at the Memorial Tournament and shot a couple of steady, if not spectacular, rounds over the weekend to finish in a tie for 37th. Monday brings one of the most exciting day in the golfing calendar as nearly half the field of this year's US Open at Pinehurst will be filled at sectional qualifying tournaments across the country. Michael will be competing at the Columbus, Ohio venue where 120 golfers will compete for 16 spots. Golfers will compete in two rounds at two different courses. The Columbus qualifier will utilize the Brookside Golf & Country Club and Scioto Country Club. Michael will be playing alongside Colt Knost and Cameron Percy. The Columbus qualifier will be posting scores after the front and back nines of the first round and then live hole-by-hole scoring will be posted for the second round. Michael Thompson's day didn't start off as well as it finished. Early, he 'didn't have the best warm‑up session' as he got ready for his first round at the Memorial Tournament presented by Nationwide Insurance. Then his first tee shot found the rough left of the fairway. He had to lay up short of the green for his second shot and eventually he was looking at an eleven foot putt for par. He made the par save and from that point on it was all systems go. I managed to make a good save on 1 that just kind of got the round going, and then from there on I had eight birdie chances on the front nine inside 15 feet. It didn't seem like I could miss a shot. I missed a few little short putts, but turned it 4‑under. And just all‑in‑all a great day. A little hiccup on 17, but I can't be too disappointed. At the end of the day Michael was sitting at five under par tied for fifth. He sits four shots off Rory McIlroy's lead but just a single shot back from second. He tees off from the tenth hole tomorrow at 1:27pm ET with playing partners D.A. Points and Russell Henley. I like to play a fade. That's what Jack was known for, and a lot of his course designs fit that type of golf shot. So visually it just appeals to me. It's obviously in great condition. The greens are fast. I love fast greens. Putting is my strength, and that's what I rely on. And when you get really fast greens, it allows me to kind of go out there and do what I do best. So this is one of my favorite events. And to shoot a round like today on this golf course is special. Michael Thompson will be making a visit to Jack Nicklaus' Muirfield Village this week at the Memorial Tournament presented by Nationwide Insurance. He will be looking to build on last week's T10th finish at the Crowne Plaza Invitational. It was his first top 10 finish on the year. On the year, Michael has made 11 of 15 cuts and notched six top 25 finishes which matches his total number of top 25 finishes from all of last year. Michael finished last year's Memorial tied for 8th. Michael will be grouped with Russell Henley and D.A. Points for the first couple of rounds. They will get round one started on Thursday morning at 8:37am ET from the first tee. A birdie barrage on Sunday has Michael Thompson climbing the leaderboard at the Crowne Plaza Invitational at Colonial. He has six birdies through 13 holes and is three under on the day. He is currently tied for 13th as he heads for the closing stretch. Michael is paired with Sean O'Hair for his final round. Michael Thompson watches his tee shot on hole #17 during the first round of the Players Championship. Michael Thompson's day got off to a bad start when he three putted both of his first two holes and was two over par before 8am. Despite the rough start, Michael would play the rest of his round at 3 under par and ultimately finished the day with a one under par 71, He is currently tied for 48th. Michael and playing partners Brian Gay and Stuart Appleby start their second rounds from hole #10 at 12:57am ET. The island green. That's pretty much the first thing most people think of when the PGA Tour head's to the Player's Championship at TPC Sawgrass. The famous island green of the par three 17th hole is often the pivotal hole at the Players Championship. Just ask Sergio Garcia who was in contention last year until his tee shot on the 71st hole of the tournament found the water. Michael Thompson will be making his third appearance at the Players. He comes into the tournament playing well. He even made it into Rob Bolton's Sleeper Picks article this week. Michael will be playing the first two rounds with Brian Gay and Stuart Appleby. Their first round tee time is at 7:47am ET from the first hole. 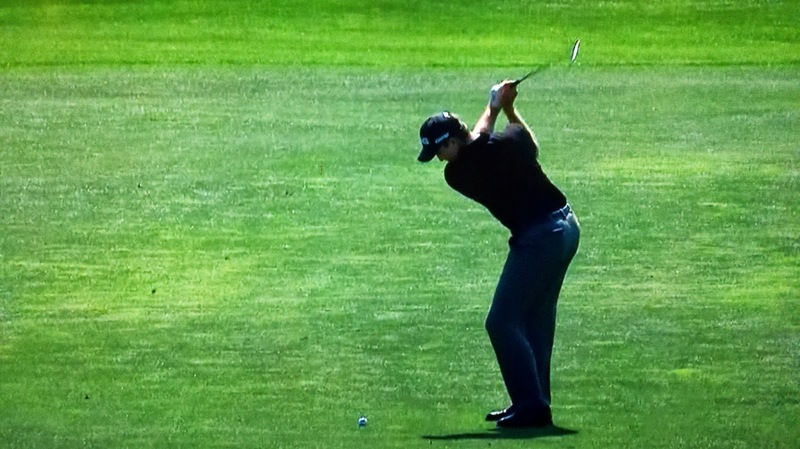 Round four didn't start off well for Michael Thompson at the Wells Fargo Championship. He started bogey-bogey to fall down the leaderboard and he didn't hit a fairway until the eleventh hole. Despite that, he would grind all day and ultimately post an even par 72 which was good enough to finish tied for 11th - his best finish of the year. On the day Michael only hit two fairways, his lowest total for any round this week. He also only hit half of the greens in regulation. Even with those struggles, Michael managed to make six birdies on the day including an 11 yard chip in on the par four 16th hole and a 76 foot birdie putt on the par three 17th (see the video below). Michael ended his fourth round with a strokes gained putting stat of +1.444 and he finished the week 2nd for the entire tournament. He is now 9th on Tour in the strokes gained putting stat. Michael will be looking to continue his good form into this week's Players Championship. For the second day in a row, Michael Thompson shot a 3 under par 69. That moved him up 4 places into a tie for 8th place. He'll look to continue his consistent play as he tees off Sunday at 1:00 EST with Geoff Ogilvy. During round one of the Wells Fargo Championship, Michael Thompson took advantage of the par fives at Quail Hollow making birdies on three of the four of them. However, as well as he played the par fives, the par threes at Quail Hollow gave him just as much trouble where he bogeyed three of the four. A lone birdie on the final hole of the day left Michael at one under par for the round and he is currently tied for 23rd. Michael will be looking to keep his current streak of five cuts made in a row in tact and move up the leaderboard Friday morning. The conditions are expected to be mild when Michael tees off at 7:30am ET with Johnson Wagner and Ted Potter Jr.
Michael Thompson tees off on the 18th during Round Three of the Zurich Classic of New Orleans. Moving day at the Zurich Classic of New Orleans didn't go as planned for Michael Thompson. Two tee shots into the water within a three hole stretch pretty much sank his round as he ended up with double bogeys on both holes 4 and 6. Ultimately, Michael finished his round at +3 on the day and is now -4 for the tournament and tied for 59th. Michael will try to regain his form from the first round in today's final round. He will be playing with Tag Ridings. They will tee off from the first hole at 9:00am ET (8:00am local time). Michael Thompson's first round at the Zurich Classic got off to a great start when he birdied the first two holes. It turns out that Michael was just getting warmed up. That first pair of back-to-back birdies would be first of four pairs of them over the day including three during his first nine holes alone. At the end of the day, Michael posted a six under par 66 and is tied for fifth going into Friday's second round. His first nine holes (the back nine on the course) were nearly flawless as he scored six birdies and three pars and he had birdie looks at the three holes he parred. He had a little more trouble on the front nine where he bogeyed two holes but he finished his round the way he started it - with back-to-back-birdies. Here's an interview Michael did after his great round. Michael Thompson tees off in just moments at the Zurich Classic of New Orleans. Although Michael loves New Orleans , the Zurich Classic hasn't been kind to him as he missed the cut both times he played this tournament in the past. Micheal will look to reverse that trend and continue his fine form that he's shown throughout this year. Michael will be paired with D.A. Points and Boo Weekly. They tee off from the tenth hole at 2:00pm ET (1:00pm local time). Michael Thompson knocks his approach shot close on hole #17 during the second round of the Shell Houston Open en route to a birdie. After last year's season of ups and downs on the PGA Tour where he only made 11 out of 22 cuts, Michael Thompson was looking for more consistency entering the 2014 season. It looks like he's found it. After shooting a second round one over par 73 at the Shell Houston Open, Michael made his ninth cut in 11 tournaments this season and improved his made cut streak to four events in a row. He is currently four under par and tied for 18th. Due to a bad weather forecast for the afternoon on Saturday, the PGA has moved tee times up and players will be grouped in threesomes. Alternate starting tees will also be used. Michael will play the third round with Rickie Fowler and Chris Stroud. They will tee off from the first hole at 8:20am (9:20am ET) local time.